Buyer guide: ABB TB82PH and WTW DIQ/S 181 Hey, all! Today we have two multi-parameter pH transmitters, the ABB TB82PH and the WTW DIQ/S 181. Hey, all! Today we have two multi-parameter pH transmitters, the ABB TB82PH and the WTW DIQ/S 181. Yes, it gets confusing when companies pick numbers and letters out of a hat instead of creating actual names, but what can you do? Nothing but get into the buyer guide! 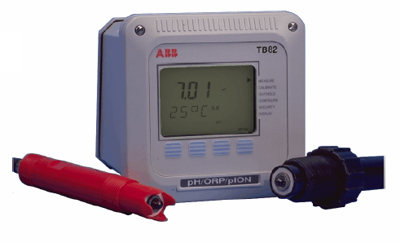 ABB joins us today with the TB82PH, a loop-powered multi-parameter transmitter. So let’s check out the features and see how this device can add value to your application. At first glance, it doesn’t seem that fancy. Of course, some retro lovers dig its old-school design. But even if you don’t, then you can get past that if it delivers an excellent user experience, accurate measurement, or other benefits. So let’s see if it does. The simple display shows your process variable and an alert if an issue comes up. The entire device barely weighs in at 1.9 kilograms without the pipe mount (3.4 with) and only takes up 144 by 144 by 171 millimeters in your process. Now ABB calls this a multi-parameter transmitter, but it has only one channel to measure process variables! So where does the multi fit in? Well, you can switch out sensors, I guess. But how many people here expected more? Not wise to raise expectations, then fall short, ABB. The TB82PH can measure pH, oxidation-reduction potential (ORP), and selected ions (pION). It comes with approvals such as Factory Mutual (FM), Canadian Standards Association (CSA), and ATREX 100A. Also, it has an IP65 rating, meaning dust-tight and water resistant at lower altitudes. As for protocols, it has analog, HART, FOUNDATION Fieldbus (FF), and PROFIBUS PA. While that list covers most applications, a little Ethernet might’ve kept it ahead of the competition. ABB has a strong reputation to support its simple device, and this reputation holds up. The TB82PH offers a solid user experience with good reliability and even throws in a few diagnostics. If you want fancy, then ABB has other options for you to look at. But if you just want a simple, cheap device to measure your process, then consider the TB82PH. Now let’s look at WTW’s offering, the DIQ/S 181. WTW may not ring a bell in some countries, but this company has some good analytical devices. So we’ll see what this device has for us. The DIQ/S 181 has a whiff of familiarity to it. And what does it remind you of? I’d say a home thermostat, and yes, that’s good. It helps a lot to give users a familiar design. Small and light, it weighs around 0.7 kilograms and measures out at 144 by 144 by 95.2 millimeters. I like its white backlight more than the typical orange or green. Regardless, you can configure it through the local keypad and its direct navigation. Once again, we have multi-parameter claims, and once again, the product falls short. It has only a single channel for a single sensor. Really, WTW? Anyway, it can measure ORP, conductivity, oxygen, or turbidity. And that last variable doesn’t show up a lot on the market, so keep that in mind. WTW DIQ/S 181 comes in an IP66 enclosure, but when it comes to approvals, we got bupkis, nada, nil, and zilch. And no loop power, either. Yep, cables everywhere. But wait, there’s more! No digital protocol, just analog. Harsh but true. Though the downsides seem pretty intense, you have to remember the DIQ/S 181 is an entry-level device. So it provides a compact design and easy setup for a good price. Although it doesn’t have digital protocols, it has two analog outputs and three relay outputs. You can do a lot with those. And it provides a decent user experience with its menu navigation and mobile platform. So both devices present themselves as good entry-level options. If you want a simple transmitter for a process without many requirements, then either of these may suit your tasks.